Celebrity Greens of Houston is your authorized dealer and installer of premium artificial grass products throughout Houston, TX. Let our professional team of landscape experts help you design you waterless grass solution. We Offer Free Consultation & Design Estimates. Call 713-932-9997. Celebrity Greens Houston is Houston based and locally owned. We perform work across Texas and Louisiana in addition to the greater Houston area. Key differentiators delivered by our company are our long term experience, exceptional golf green design experience, diverse construction skills, attention to detail and customer support/relations. Celebrity Greens Houston is the premier synthetic turf golf putting green, lawn turf and playground provider in the region. Celebrity Greens regularly designs and installs residential and commercial projects throughout Texas. Our team’s years of experience designing and installing synthetic turf surfaces results in unsurpassed quality and performance for golf greens, ranch greens and short courses, golf course tee lines, bocce ball courts, playgrounds and synthetic turf lawns. We also provide full maintenance, resurfacing and repair support service for existing putting greens and synthetic turf installations. 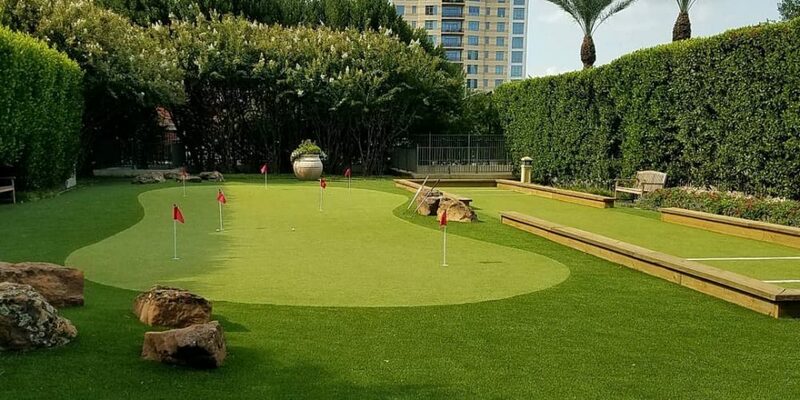 Celebrity Greens Houston provides a full complement of landscape services to complement the putting green and lawn installations. It is important to deliver a completed installation that integrates the synthetic turf surfaces with a landscape setting that flows well with the look and feel of the home or business. The management team brings experience and skills to insure your project is properly designed, the construction is handled efficiently having highest quality standards and the look of the finished project adds value your home or business setting. Terry Westbrook, has played golf as a low single digit handicapper for over 45 years; is a degreed mechanical engineer; worked on golf courses as a youth; has considerable project management experience through 20+ years of corporate life and has over 10 years of experience in the synthetic turf industry. Patti Westbrook, has primary responsibility for landscape designs and installation; has a design and art degree; has completed multiple landscape design classes; and has 10+ years designing and installing landscape settings. Joe Kilpatrick, is a highly experienced builder and synthetic turf specialist; has 15+ years of experience designing and installing synthetic turf solutions, is an avid golfer and has run a wide variety of outdoor construction projects from small home settings to extensive commercial projects. The CG Houston installation teams are composed of long term employees. The team members have accumulated over 60 years of experience building golf greens and installing synthetic turf solutions. Prior to this the individual team members have worked as landscape installers, welders, builders and stone masons. We consistently receive compliments on how professional, experienced and hard working the installation team members are. They are a true asset to this business.